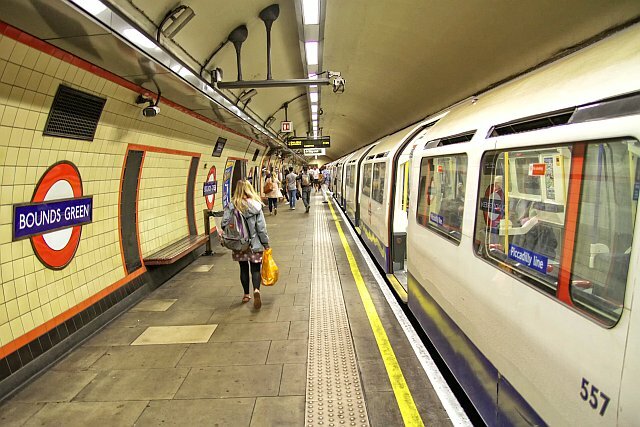 Bounds Green is the furthermost underground station on the very long tube section on the Piccadilly Line since Baron’s Court. Along with Wood Green, Bounds Green was one of the last to be finished on the new extension. It is said the station was originally planned to be known as Brownlow Road. This name is listed in a report dated 9 January 1930. Yet there’s a mystery. A station mock-up built in 1928 to show the designs for the new stations on the Cockfosters extension happens to be the prototype for Bounds Green – and was complete with roundels most definitely showing that name! En route to Bounds Green the Piccadilly Line makes its second pass under the New River in the vicinity of Trinity Road where it meets the overland route of the New River path. The routes are in tunnel and the close proximity of both meant the New River’s tunnel needed to be reinforced with steel & concrete. This little known work took place during 1930. 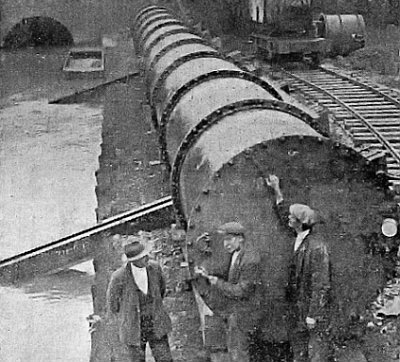 The unique way in which the work was done was because essential supplies to thousands of homes could not be stopped, especially as these were the days when the New River’s water continued to be filtered at Stoke Newington before distribution throughout North London. 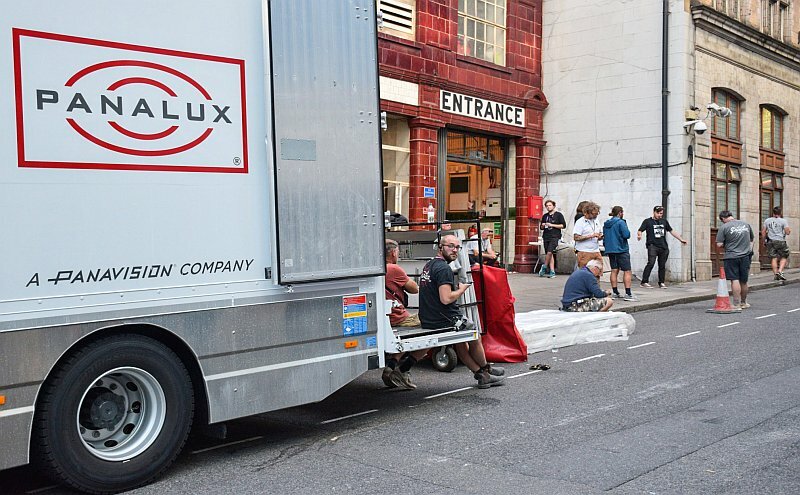 The work involved the use of a 90 foot section of 6 foot diameter temporary steel tunnel which had to be built by the entrance to the New River’s long tunnel leading to Wood Green. This steel structure was then floated into place inside the tunnel. Once this was done it enabled the water to continue flowing whilst the relevant section of the main tunnel around this temporary structure was drained and then relined with steel and concrete. Upon completion of the works the temporary steel tunnel was removed and the completed tunnel put to use. Had it not been for the New River I believe Bounds Green could possibly have been a somewhat shallower station though not in the open because of land constraints and development that would have still forced the tunnel exits to be a little further north. Bounds Green. Note the seating, now anchored to the walls rather than placed in alcoves. Bounds Green station is somewhat different from the other underground stations (eg Manor House, Turnpike Lane, Wood Green.) The seating alcoves were done away with and seats anchored to the walls themselves. This was done to save costs and the same was applied too at Southgate. As was done too at Southgate, the ventilation grilles were standardised types, there was no longer any desire to illustrate local scenes, so again that special element remains unique to the previous three tube stations. The station was designed by C. H. James, a colleague of Holden’s, presumably due to the amount of work faced by Holden in designing the other stations on the extension, and elsewhere, including the new Holborn tube station and those down the other end of the Piccadilly Line towards Hounslow West. I am sure C.H James was the one who decided upon the economy measures to be implemented at Bounds Green, and these were employed by Holden himself at Southgate further up the line. James of course had licence to use Holden’s designs at Bounds Green which is naturally why it looks so much like Holden’s work. I have wanted to show how the station platforms looked with their continuous chain of down lights either side of the tracks, and fortunately there’s this 1932 photograph of Bounds Green shown below. It was taken some months before services began. 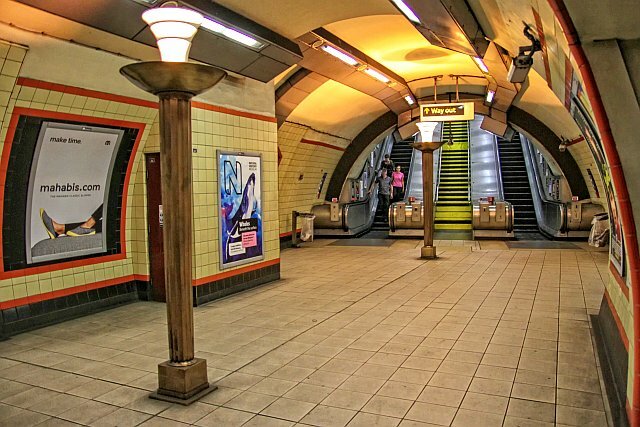 Just to reiterate this most unusual form of platform lighting lasted a few short years before removal about 1942. Astute readers may notice the destination indicator with the non stop train panel. One feature of the new line was a host of express services that only stopped at certain stations. They could even go from Bounds Green non stop to Cockfosters but this shows one that would miss out the stop at Arnos Grove station.These non stop services were also replicated on the Hounslow and Uxbridge branches, yet very little record exists of the services on offer. 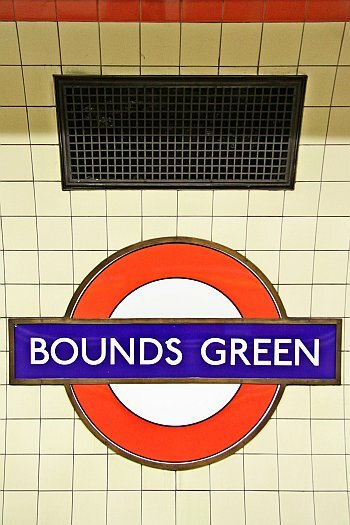 Bounds Green tube station’s colours are a orange-red shade. Amazingly similar to another tube line in London. Its most certainly a twin of Wanstead Station on the Central Line, very similar styling and colours, even down to the lights. 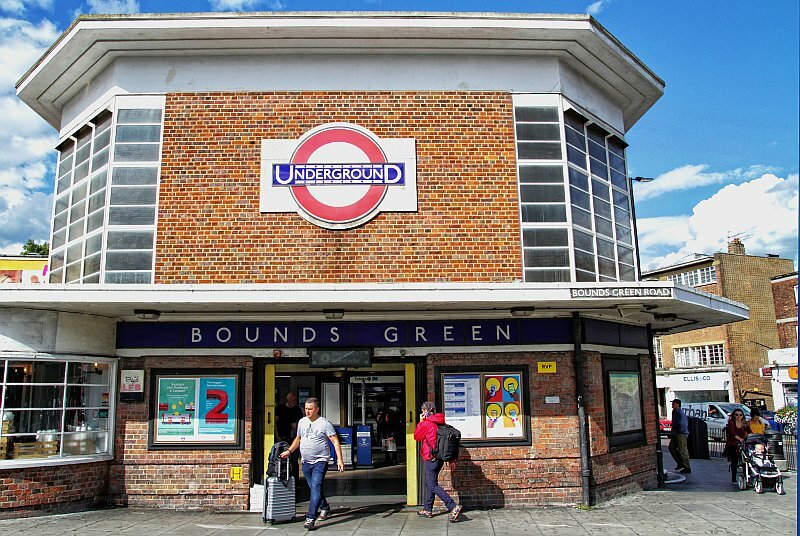 The biggest irony is Bounds Green was not designed by Charles Holden yet was used as the very model for his Wanstead and Gants Hill stations! The station was hit by a wartime bomb in October 1940. The bombs demolished a house nearby and the force was so powerful it caused the collapse of the northern end of the Bounds Green platform. Damage was very extensive and it took five days to bring out the bodies. 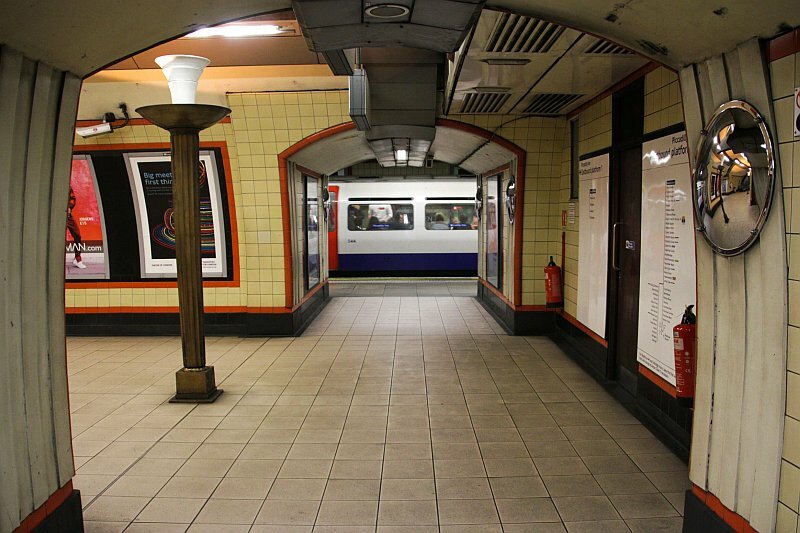 The Piccadilly Line was closed at this point for two months whilst the rebuild was underway. In the meantime, November 1940, another bomb hit a nearby water mains and this flooded the ticket hall. The plaque on the Central London platform at Bounds Green. The plaque can be easy to miss, I certainly missed it and went around the station looking for it. Even the staff just did not know where it was! Its absolutely at the very top end of the westbound platform where it can be simply missed. It is said the repairs to the damage caused in 1940 were not fully completed till the 1990s. The tunnels and platforms were repaired of course to allow train services to recommence, but the tiling was not restored for another fifty years. At some point in the station’s history the bank of three escalators was reduced to two, the central one becoming a fixed stairway. The same thing was done at Southgate. There are pictures illustrating the use of Bounds Green’s escalators as accommodation for people to sleep on during the blitz. The same link shows the bombed tube station, as mentioned above. The current escalators are of the modern type, so nothing of interest about them. The station ticket hall however is of interest because it sports one of Holden’s uplighters. The ticket halls at the other stations once had these uplighters but not anymore so we have an unusual situation here with this one surviving example. The lower hall and escalators at Bounds Green, the Holden uplighters much in evidence. The cross platform connection and lower hall with one of the pair of classic Holden uplighters. The ticket hall with its Holden light, a good advert for the Metro! Of the main surface buildings, the main structure is again a different style to the rest. Its of an octagonal shape yet a much smaller building than the others. There is a brick chimney to the rear which is an air vent and sports classic LT roundels. The main entrance to the station. Note the octagonal design. **Queens Parade, directly opposite the tube station, emulates some of Holden’s designs especially the curved frontage with its supporting column (the main example of which can be seen at Arnos grove.) However it is of a much later construction and not related to the tube nor the 1932 extension.